Santa Eulària is the second most populated municipality of the island, after the city of Ibiza. It offers a number of beaches, breathtaking landscapes, lonely fields and magical markets that attract hundreds of tourists every year. Surmounted by a fortified temple, the Puig de Missa, it offers all kinds of services and facilities throughout the year. Located 20 kilometers from the airport, it is a favorite for families and those seeking a quiet holiday destination. And Santa Eulària enjoys much activity throughout the year. It has many services and shops, a beach in the city center, an attractive promenade and a marina. In addition, it is the nerve center of the island for golf lovers, since there is the only area of ​​the entire island (on the road leading to Cala Llonga). As already mentioned, Santa Eulària has a lot of activity throughout the year, in addition to many shops, stores and services that will delight the visitor. The beach, the promenade and the marina, full of yachts, leave an indelible print. And in the center, the streets of the town are expanded into two main arteries: Calle San Jaime, full of shops, restaurants and shops; and the Port of S'Alamera, crossing the street San Jaime and links the seafront to the Town Hall Square through a beautiful boulevard. In addition, attached to the Town Hall Square is the famous street of San Vicente, also known as the street of restaurants. The most famous hippy markets of the island are in Santa Eulària. The famous hippy market Las Dalias in Sant Carles, takes place every Saturday throughout the year. Meanwhile, the market of Punta Arabi in Es Canar, takes place every Wednesday from April to October. In both you can find all kinds of objects, gifts and curiosities from every corner of the island. Moreover, in the summer months the ride stops S'Alamera hosts various artisans arrived from all corners of the planet. Santa Eulalia has a beautiful coastline studded beaches, islets, cliffs and defensive towers. Among its most emblematic coves highlight the nudist beach of Aigües Blanques, Es Figueral, Cala Boix, S'Argamassa, Cala Pada, Cala Llenya, Cala Nova, Es Canar, Cala Martina and Cala Llonga. All of them are coves of fine white sand, although there are sailors idyllic corners, like the legendary Pou d'es Lleó and Cala Mastella. Undoubtedly, all allow you to enjoy the crystal clear waters of Ibiza. 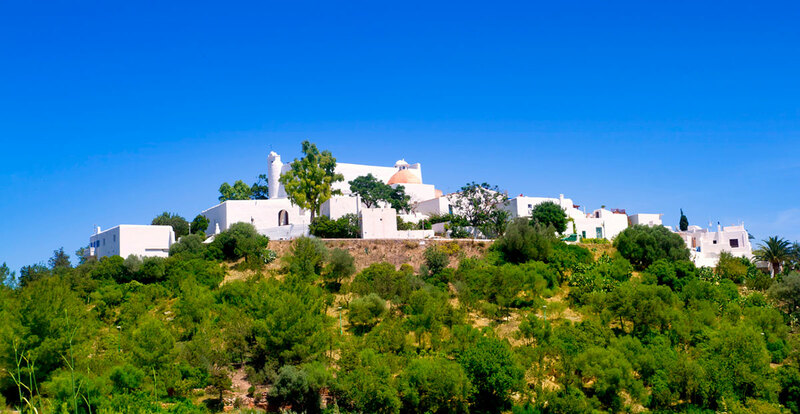 Which for the first time to delve into Santa Eulària you will be impressed by the majestic silhouette of Puig de Missa, the mountain that crowns the village. It is a must see from which to see the whole city, with magnificent sea and mountain. To defend against pirate raids that attacked the bridge of Santa Eulària, the inhabitants of the city built a temple on top of the mountain, which has been destroyed several times throughout history. A walk through the cobbled streets of Es Puig de Missa allows fascinate our senses with the church or the beautiful cemetery behind it. In addition, the Ethnological Museum of Ibiza is located in Es Puig de Missa, the perfect place to experience life in Ibiza place a century ago. The municipality of Santa Eulària also hides other pinturescos villages like Sant Carles de Peralta, Santa Gertrudis de Fruitera or Jesus. All three agree its small size, the simple beauty of its churches and bucolic and peaceful atmosphere. In addition, Santa Eulària offers some unforgettable walks, such as a visit to the Tower of Campanitx, located between Pou d'es Lleó and Cala Boix where contemplate a landscape of fields and sea, dominated by the islet of Tagomago.